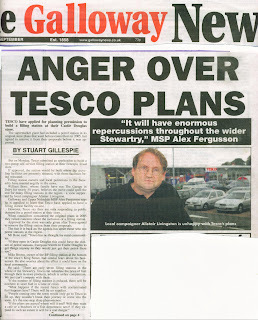 In March 2005, a meeting of the Stewartry (of Kirkcudbright) Area Planning Committee of Dumfries and Galloway Council gave Tesco permission to build a food store in Castle Douglas. The meeting, held in Castle Douglas Town Hall lasted from 10am until 6pm. Midway through the meeting, it appeared as if the local councillors would reject Tesco’s application. Their sticking point was the inclusion of a petrol filling station as part of the food store plan. The councillors were clearly moved by representations made at the meeting by the owners of rural petrol filling stations who pointed out that as well as selling petrol, they also offer car maintenance and repair services. These essential services are cross-financed by the selling of fuel. Faced with competition from Tesco, who can use petrol as a ‘loss leader’ (as in Tesco’s current ‘Spend £50 on shopping and get 5p/litre of the price off petrol at our stores ‘ promotion) the fear was that a Castle Douglas food store plus petrol filling station would put these rural petrol stations and garages out of business. This it was argued would have a damaging impact on the viability of Castle Douglas’ rural hinterland, given these areas’ minimal public transport provision. This argument appeared to be on the point of swaying the planning decision, but faced with loss of the whole development, Tesco’s representatives agreed to withdraw the petrol service station. This change to the planning application midway through the planning meeting was challenged, since it appeared to conflict with usual Dumfries and Galloway planning policy. In other circumstances, such a change would have required a fresh planning application. Once the petrol station part was removed, the Stewartry Area Planning Committee gave approval to the food store part of Tesco’s proposal. However, although the full Dumfries and Galloway Planning Committee were on hand to make the final decision on the Tesco application, due to the many procedural questions raised , their meeting was deferred until the 9th April 2005. Re-assured that the March meeting had reached a legitimate conclusion, final approval for the Castle Douglas Tesco (minus petrol filling station) was granted . The Tesco store was opened in February 2006. 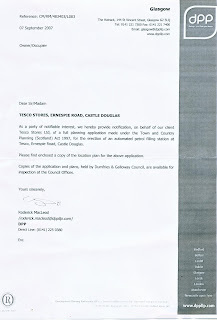 Tesco have now - see letter dated 7 September 2007 as attachment - applied for planning permission to erect an ‘automated petrol filling station’ at their Ernespie Road, Castle Douglas, store. I suggest that , as successfully argued ( and effectively admitted by Tesco in their decision to withdraw it) at the planning meeting in March 2005 and confirmed by the full planning committee in April 2005, the inclusion of a petrol filling station as part of their Castle Douglas food store is a development too far. The Stewartry of Kirkcudbright is the most rural and hence socially and economically fragile part of Dumfries and Galloway. If, and only if, Tesco can prove that their proposed ‘automated petrol filling station’ will not damage the vitality and viability of essential services provided by existing rural (village, small town) garages and petrol stations should planning permission be granted. Tesco are a multi-billion pound global company. Do they really need the tiny increase in profit this development will bring, given the damage it will do to our already fragile rural economy and society?